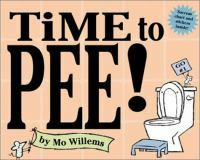 I can’t remember anymore where I got the idea for Potty Storytime. Maybe someone posted about it on Storytime Underground? Anyway, I put it on my calendar ages ago to have this during the summer. A lot of families seem to potty train in the summer, either because the kids need to be out of diapers to start preschool in the fall or just because it’s easier with summer clothes. I wasn’t sure if anyone would show up – it seemed a bit out there – but I had 20 kids and 18 adults, and they were all pretty enthusiastic. One mom mentioned that she liked it because her son was a bit resistant to using the potty, so it was nice to hear another adult talk about it without any pressure to actually perform. That made me feel better about avoiding some of the books I had considered where a character expresses reluctance to use the potty but then finally goes. There were a few changes I might make for next time, but I’d definitely do it again next summer, if not before.